StyleNest recently sampled a slice of Spanish heaven, flying over to deluxe 5-star resort Puente Romano, Marbella for a few days. A stunning lifestyle resort, Puente Romano is popular amongst couples and families alike. Our trip was a childfree venture, with myself and good friend enjoying a grownup escape. After being met at the airport by our transfer driver Danny, we were received with an extra warm welcome on arrival at the resort itself. 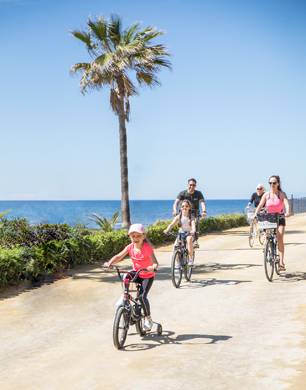 A 45-minute drive from Malaga airport, Puente Romano is located on the Golden Mile, between Marbella and Puerto Bonus. Its vastly impressive backdrop comprises the mountainous La Concha, while you face directly out onto the Mediterranean Sea. Puente Romano is an all-suite and villa resort where we stayed in a Junior Suite, overlooking one of the three outdoor swimming pools and wellbeing poolside foodie destination, Rachel’s. A luxurious suite, complete with signature stylish décor, the marble bath is a huge treat.. The suite has a terrace complete with seating, plus inside sitting area. Chic fabrics and clean interiors are sleek integral themes, with you instantly feeling both at home and immersed in utter luxury; a winning holiday combination. We then received a full tour of the resort, shown around by Puente Romano Public Relations Manager, Jana. Jana guided us through each area, offering additional information about Puente Romano. Highlights include the stunning greenery throughout, with tropical plants aplenty plus pretty bridges over flowing streams, all guiding you down to the seafront. Puente Romano Tennis Club is home to spacious courts which host international tournaments and globally renowned tennis players. Within the club you can receive private lessons, participate in tennis programmes, watch upcoming tournaments and events, and there’s a fully equipped fitness centre for your own workouts too. Coaching covers kids too, including Mini Tennis for little ones over 3. Furthermore, extensive golf and football activities are available as well. The resort is jampacked with excellent sporting facilities, events and fitness teachers who are leaders in their field. Following the guided tour, we settled at fresh fine dining restaurant, Sea Grill. Situated on the sea front, there was a light breeze making for a chilled out blissful lunch. Sampling their new tapas menu, Petite Sea Grill; delights included white fish sashimi, croquettes, anchovies and a truly delicious gazpacho with avocado base. Combined with a rose rioja, it was the ideal start to our stay. Locally sourced produce is the order of the day, and seafood is on display to tempt you into Sea Grill. Impeccable service, the restaurant sets the tone for the entire resort. That afternoon consisted of settling in and exploring, poolside lounging with smoothies from Rachel’s and getting ready for an evening at Nobu. Beginning our night with drinks in La Plaza, I sipped a chilli mojito as recommended by Jana. Surrounded by glitz and glamour, La Plaza is an outdoor courtyard bar with luxe seating and twinkly lights strung overhead. It’s basically the central evening hub for Puente Romano, and guests dress to impress. We even spotted a few famous faces amongst the chic crowd settling on sofas and high bar seating. It was then a very exciting privilege to be given a table at Nobu Marbella, the most sought-after seat around. Overlooking La Plaza, Nobu team member Paula waited on us and made our Nobu experience even more memorable. Whilst drinking wine, we were talked through the dishes and chose tasty options Paula recommended. If you haven’t been before, Nobu combines Japanese with Peruvian, in the ultimate foodie fusion. Tucking into outstanding plates, these spanned across tempura, black cod with miso, salmon sashimi, pan seared scallops, yellowtail sashimi with jalapeno and salmon avocado sushi maki. Also on offer are sashimi tacos, soups, rice, salads and much more. The atmosphere was electric and each dish mesmerising, in taste and appearance. It was truly one of the finest meals we’ve ever tasted and a unique experience that will be a treasured memory. Our evening finished with Espresso Martinis, and then, a walk down through the resort to the beach for a sandy twilight stroll. Heading back up to our suite, the wildlife hummed and it was a magical end to our first night. 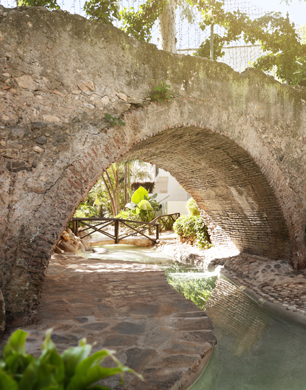 Puente Romano conjures up an idyllic scene with an unmissable ambience and is a one-off adventure. After an excellent night’s sleep in our dreamy suite, breakfast beckoned. A sweeping room with indoor and outdoor seating areas, we grabbed plates and began tucking in. Gluten-free treats from nearby specialist bakery Celicioso covered carrot cake and muffins. Other options include a cooked breakfast of meats, eggs and pancakes, cool plates like hams, salads and caviar, alongside fresh fruit, pastries, smoothies, cereal and juice. I put together a bowl of berries, eating gluten-free toast, sipping coffee and later, returning for avocado and smoked salmon. Onto the day and we ventured down to the pool beside Sea Grill, for a little relaxation before I was to explore the Six Senses Spa. Stepping into the heavenly space, I walked through a reception area and into their calming room where you await and soak up the soothing spa vibe. Greeted by lovely yoga teacher Claudia, we chatted for a while and then meandered up to the roof terrace above. Following Claudia through the spa itself, we stepped onto stones fixed within water and admired the stunning inside spa pool’s waterfall looking onto the beach. Once upstairs, Claudia and I sat on mats and began to warm up. Somewhat of a yoga beginner, we went at my pace and also explored some mindfulness and meditation. One piece of simple mindfulness which has stayed with me, is to stop and breathe even when doing something as basic as washing your hands. Claudia suggested enjoying the water lap over your palms and inhaling the soap’s aroma. I have done this a lot since being back home, and really got so much out of this session- it was wonderful and such a delight to enjoy on the sunny roof terrace overlooking the expansive Mediterranean sea. Afterwards I sat down with some ginger tea in the relaxation area to reflect. Completely rejuvenated from my one-to-one session, I had time to relax for a little longer before strolling down to Ibizan restaurant El Chiringuito. Here, Hugo was on hand to pour Bollinger as soon as we sat down and insist on us trying the spectacular lobster. If I’m honest, I now expect champagne at 1pm every Tuesday afternoon. I also tucked into a tuna steak burger, and we lapped up the chilled-out beachy Ibizan vibe whilst there, which was ideal for the holiday spirit. Later that afternoon, I returned to Six Senses and met therapist Angeles, ready for my Active Wellness Deep Pore Facial. Summing up the Puente Romano ethos, the entire resort embraces wellness for body and soul, and that’s what I loved most about it. Settling down for my facial, Angeles worked through different products, each designed to deeply cleanse. I was at one point so relaxed, I actually fell asleep. Other treatments available include: Pure Oxygen Treatment, 24K Gold Age Defying Facial and Collagen Rejuvenation Treatment. The epitome of tranquillity, this spa is so serene. After the facial, my skin was completely glowing and I felt awakened and definitely invigorated. Once we’d done a little more relaxing and exploring, it was time to get ready for a beautiful evening back at Sea Grill. This time we tucked into chicken tikka and paella, followed by hazelnut praline meringue and with more delicious wine. The vast array of different global dishes is brilliant, and there was a variety of diners sitting alongside us, from friendship groups to young families and parents with adult children. The next morning, we worked our way through the delicious breakfast options for one final time and reluctantly left to begin our journey home. Leaving with happy souls and rested bodies, I heartily recommend a trip to Puente Romano. The resort offers everything you could need, from food and drink delights to mindfulness and active programmes, and not forgetting, breath-taking views with an atmosphere to match. You can even experience a hiking package, exploring those amazing Spanish mountains. A Marbella must-visit, I can’t wait to return one day soon. Enjoy the Puente Romano Hiking Package priced from €2,560 based on 2 people sharing, from €4,265 based on a family of 4 and from €2,105 for solo travellers. Other packages include: Yoga Detox, Integrated Wellness, Sleep, Soothe and Sea and Mindful Living.